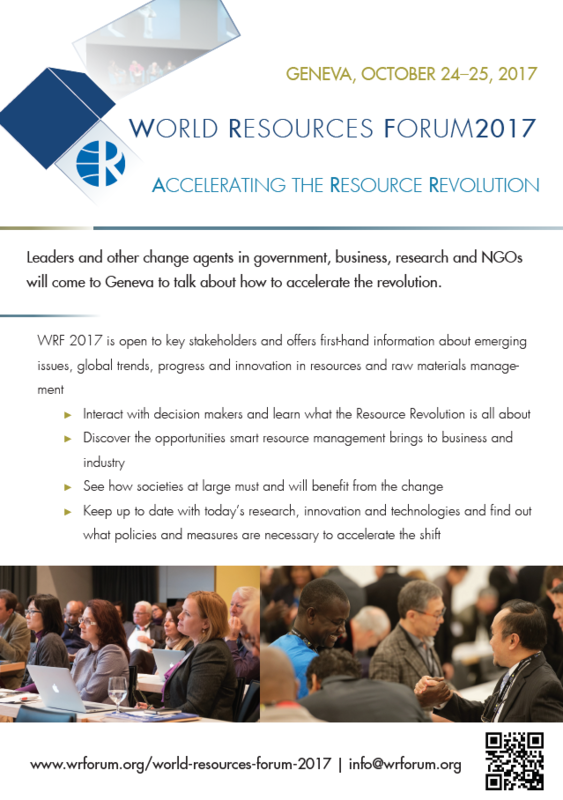 The World Resources Forum (WRF 2017) was held on 24 – 25 October 2017 at the Centre International de Conferences (CICG) in Geneva, Switzerland. WRF 2017 addressed the topic of “Accelerating the Resource Revolution”, highlighting the importance of the Sustainable Development Goals and the Paris Climate Agreement as calls for action. Over 120 state-of-the-art scientific contributions were presented and methodologies and success stories were shared during the 16 workshops organised by international institutions. More than 450 participants from 50 countries shared four days of discussions, networking and side events. See more information about the WRF 2017 in this News Article, find here the presentations of our speakers and check the WRF 2017 Photo Gallery.